Lifts, Portable - Jacques Pilon Medical inc.
One unique range, four different model options. Each intelligently designed to suit both user and carer. Introducing the new Wispa range, the safe, powerful solution to moving and handling, with precise fingertip control. 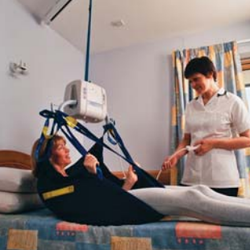 Aesthetically designed, the Wispa Lite, 100, 200 and 300 provide a neat and unobtrusive system, for controlled transfer from the bed, wheelchair or floor. 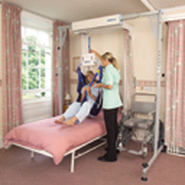 Wispa fits almost anywhere, even into confined spaces such as multi-bed hospital wards, where limited space may hinder the use of a mobile hoist. weighing only 7kg, the Wispa Lite is easily transported, attached and detached on a ceiling track. Powerful, controlled lifting - Maximum load 200kg. 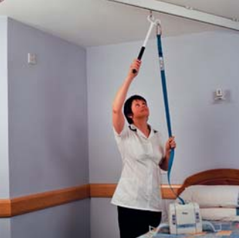 With varying lengths of lanyard and attachment handle, carers can comfortably attach the Wispa Lite to ceiling track, whatever its height. 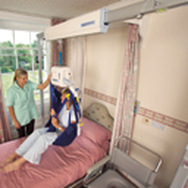 Compatible with ceiling track or freestanding gantry systems offering controlled transfer from the bed, wheelchair or floor. Clearly identifiable buttons, ergonomically designed. The Wispa Lite can be operated via controls on the cover or from the handset, thereby reducing risk of not lifting/lowering clients if the handset is lost or damaged. 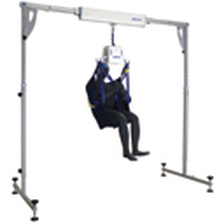 Soft start/stop lifting for added user comfort, safety and control. Prevents the lifting tape from over-winding into the case and up to the ceiling track. 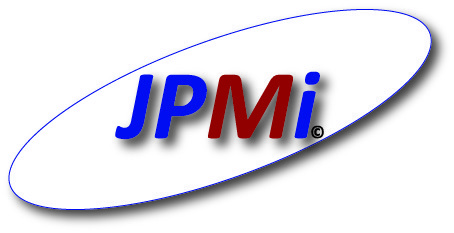 This mechanism prevents the lifting tape from winding out of the cassette when an obstruction is encountered during lowering, preventing jamming of the tape. Enhanced sling attachment design offers wider sling positioning to improve user comfort, whilst providing maximum head clearance. In the event of hoist failure, Wispa Lite is fitted with an emergency lowering switch providing safe, controlled descent. 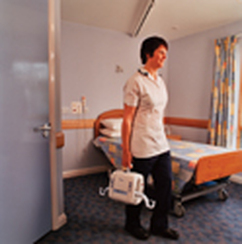 Safe operation, should an emergency arise, providing reassurance for both user and carer. 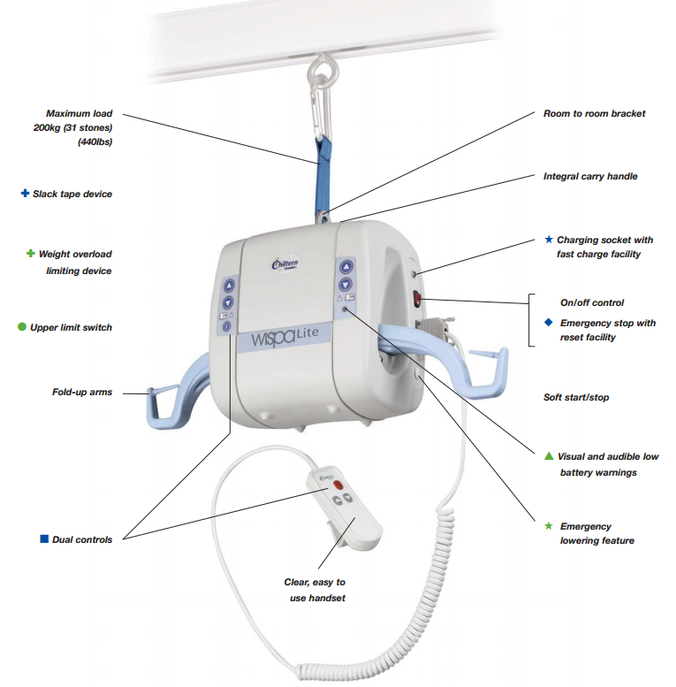 The hoist is easily reset via the handset or controls on the hoist. If too much weight is applied, the Wispa Lite will only allow lowering. Visual and audible warnings indicate when the hoist should be recharged. With its integrated recharging feature, the Wispa Lite can simply be plugged into the nearest mains socket. Wispa Lite can be fully charged within 2 hours. Vigorously tested to ensure long product life expectancy. Audible (from hoist and handset) and visual signals (on hoist cover) indicate faults and battery status. Wispa Lite comes with a two year guarantee. 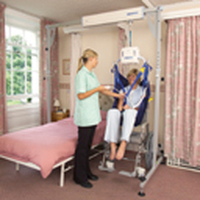 The lightweight, portable moving and handling solution for the the home, hospital and care environment. LiteTrack transforms easily from a fully assembled gantry to a lightweight and easy to transport system, in line with manual handling regulations. LiteTrack can be assembled or disassembled by one person within five minutes and without the use of tools or step ladders. Totally self supporting and independent of the building structure. Provides an alternative where the ceiling construction limits fixed track installation and user preference, floor construction, positioning issues or heavy/difficult clients limit the use of a mobile hoist. The cassette glides easily across the beam for transfer from a bed, wheelchair or floor, providing a safe manual handling environment and reducing the risk of back injury. Height adjustable to maximize the available ceiling height and with a width adjustable lifting beam to suit lifting task/room layout. Suits the majority of clients. Maximum load 210kg (460lbs).